Aphrodite is a fertility goddess but also represents the charms of love. She probably originated in Crete and is known as Aphrodite in Greek and as Venus to the Romans. She is always represented as beautiful. She was born out of the sea foam—the Greek word aphros means foam—and dolphins are always her animals. 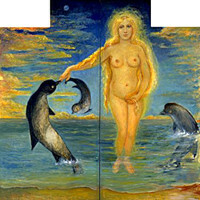 Aphrodite’s rising from the sea is a wonderful metaphor because love is so much like the sea. Everything about love is restless and moving and changing, like the sea, not like the ground. And we are equally drawn both to the ocean and to love! Standing by the sea, you just can’t believe the endless rolling in of the waves, endlessly the same pattern but never exactly the same pattern. Love is also a very direct and familiar experience, yet it is vast and eternal. And both are full of all sorts of hidden and dangerous things. If you are not careful, the ocean will just swallow you. Love, too, is such a powerful thing that it has always the power to destroy people, just as it has the power to redeem them and fill them with joy.